Many people have asked about the fellow on the cover of our "Caledonia County" recording. Born in 1937, Fred James grew up on Albert Gorham's farm in East Burke, Vermont. I worked with Freddie for several years and got to know him well. 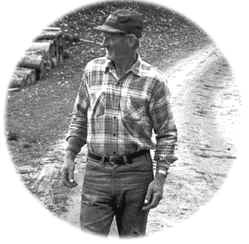 Freddie was the quintessential Vermonter - rugged, humble, a little reserved at first, but once he got to know you, as the saying goes, "he could talk the ears off a brass monkey". Unfortunately, Fred James passed away from cancer on July 7, 1999 at the young age of 62. He leaves behind a wife and four children. Freddie was a good husband, a good father, and a good friend to all who knew him. A more honest, decent, hardworking man could not be found. The world would be a much better place if there were more people like Fred James in it. Rest in Peace, buddy - G.D.